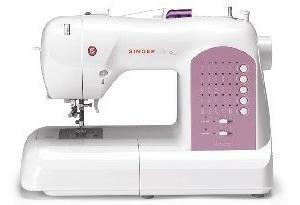 Introducing the new Singer Curvy 8763 sewing machine featuring SwiftSmart™ threading system and Drop & Sew™ Bobbin System. Together, threading is a cinch, giving you more time to explore your creativity and less time threading. Digital technology makes threading a cinch! All you have to do is guide the thread directly from the spool to the needle area through a single groove. Then, after effortlessly threading the machine, the needle is automatically threaded by simply pressing the Threader Lever, conveniently located at the side of the machine, for truly one-touch threading! Simply drop in the bobbin, then pull the thread through the specially designed needle plate and track. There’s no longer any need to raise the bobbin thread before sewing. It’s that easy! Not just 1 but 3 lamps illuminate the sewing surface for optimal viewing. The long-lasting bulbs (100,000 hours) stays cool, regardless how long the machine is operated. Tie-off decorative stitches with just a push of a button. Reinforcing the end of the stitch ensures quality stitching and avoids raveling. Most stitches can be set for a maximum width of 7mm. When sewing decorative stitches or satin stitches, the wide stitches are bolder and more pronounced. By using a twin needle and manually reducing the stitch width, two parallel rows can be sewn to add a decorative touch. Create pintucks and more with twin needle sewing. Change from one to another effortlessly with Snap-On feet. No need for screwdrivers to change presser feet. Accessory Storage area means accessories are always handy. Machine has a built-in carry handle, making it easy to transport the machine. Machine can be mounted into a cabinet. The SINGER® 8763 has a limited 25-year warranty, including 5 years on electronic components and 1 year on adjustments. Best Price! Customer Service A+ ! Will spread the word about AllBrands and shop with your company again!! !